This pattern has instructions for 2 dolls. 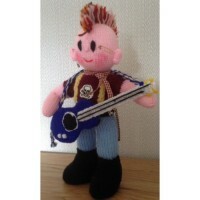 Included in the instructions for this doll are a microphone and stand. Copyright 2015 ecdesigns All rights reserved, this pattern is for personal use only. No art of this image or text may be reproduced, copied or transmitted without permission. Pattern with step by step instructions, colour photographs and useful tips. Details include:	Equipme.. 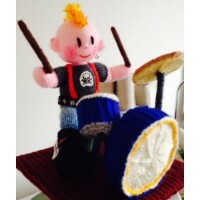 The Rock Band Toy Knitting Pattern"born to be wild"This 16 Page professionally printed pattern inclu..
Knitting Pattern with step by step instructions, colour photographs and useful tips. Details i.. 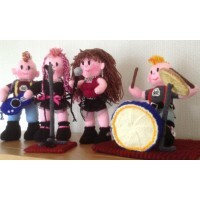 The Rock Band Toy Knitting Pattern (PDF Emailed)"born to be wild"PDF Pattern emailed on purchaseYour..